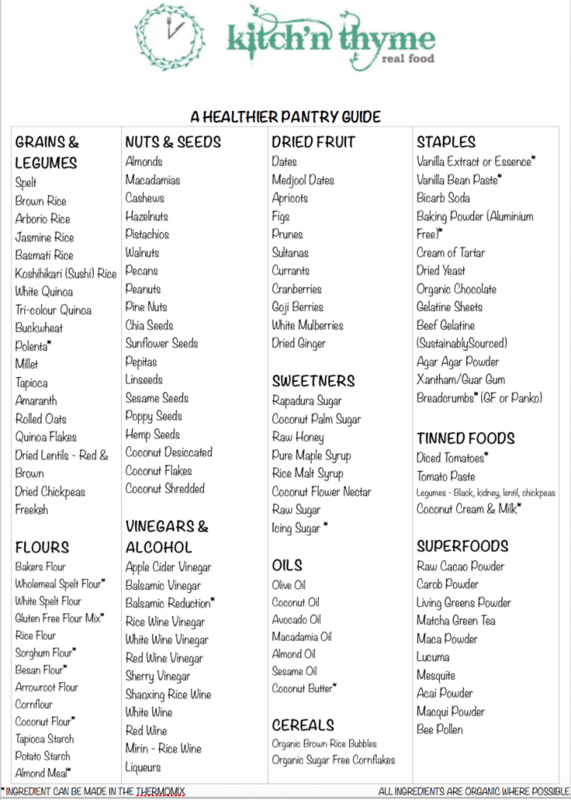 But this here below is to give you a great idea of the sorts of things that live in my pantry and the ingredients that I love to use and cook with in the recipes on my website! I love using my Thermomix to make SO many of the ingredients listed…it not only saves so much money in my grocery bill but it also helps me to know exactly what is going into the food that I cook! I love to avoid numbers, additives and unnecessary processed sugars and ingredients so that I know that what I am feeding my family is nutritious and wholesome. 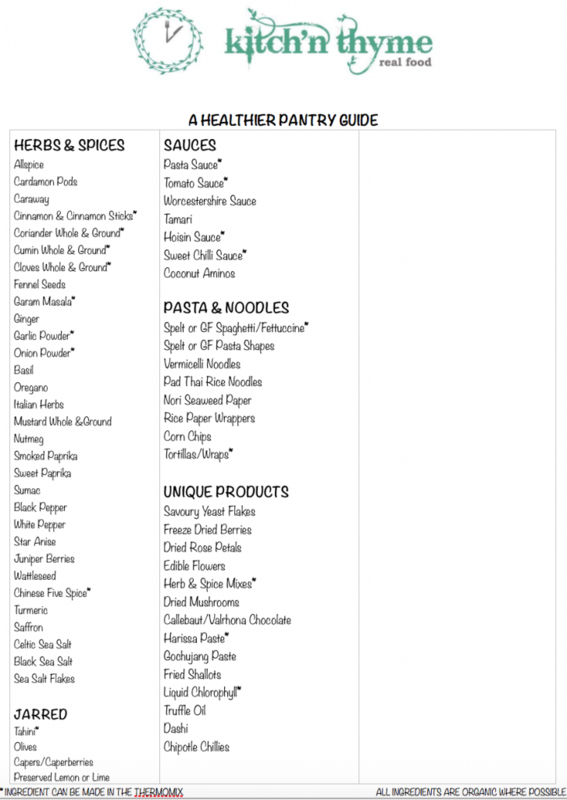 This is not what I would call a ‘Basic’ pantry list, so don’t be overwhelmed, it is a very gradual process stocking a pantry for healthful/Thermomix living, and some of those ingredients won’t be applicable to the way you cook in your home, but here is a good guide to get you started on your journey! I haven’t done a fridge or fruit & vegetable list, we’ll save that for another time! But I do suggest growing a herb garden! Fresh herbs do wonders for food and you will be amazed at how often you are searching for those fresh herbs! I primarily use Basil, Italian or Curly Parsley, Onion Chives, Kaffir Lime Leaves, Lemongrass, Rosemary, Thyme, Coriander, Oregano, Mint, Sage, Dill, Tarragon, Chervil & Micro Herbs here & there. If you haven’t seen my beautiful recipes yet, just click the tab ‘Recipe Index’ for a great picture overview of all the lovely FREE recipes I have to offer! I’m sure you’ll find one yummy thing that you’ll be looking forward to trying when you next get some Kitch’n Thyme! The ingredients marked with a star are items that can very easily be made in the Thermomix & as far as possible I try to use all ORGANIC ingredients in my home for better nutrition and to minimise the side effects of potentially harmful pesticides and chemicals used to grow conventional foods. I hope this inspires you to have a look in your pantry and perhaps even become excited about 1 new ingredient that you could incorporate into your cooking!